When it comes to the depths of winter I love nothing more than a long, warm shower to warm up and relax. This means I like to spend that little bit more on products I know I will love and offer that bit of luxury. 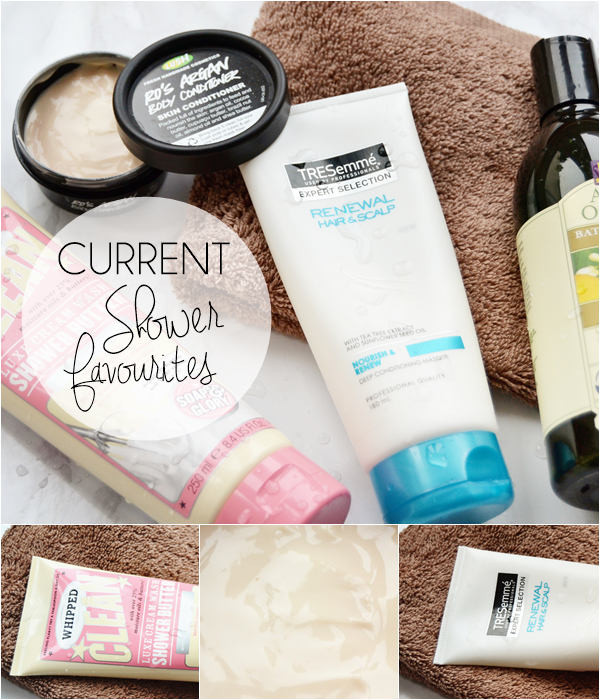 Below are a few of my current in-shower favourites that are just that bit more special and also multi-purpose. First up a shower product that is ideal for winter and parched skin that needs some intensive moisturising. According to Lush the idea of the product was based off hair conditioner... just for the body instead! And that's exactly how you use it. Towards the end of your shower simply rub a small amount over the body which will feel silky soft, then step out of the shower and pat yourself dry. This is when you will notice the slightly waxy/waterproof feel to your skin which is all the lovely oils. I don't generally love this feel to my skin but once your skin has fully dried the body conditioner fully soaks into the skin, leaving your skin fully hydrated and smelling beautiful. The body conditioner contains argan oil, cypress oil, capuacu butter, Brazil nut oil, cocoa butter, shea butter and almond oil so you know you are getting great ingredients to moisturise your skin with. As for the scent, I'm obsessed with it! I wish Lush would actually bring out a full body range in this scent in fact. To me this is a heavenly scent of both sweet rose and argan oil that just smells so unique and divine. As you may have spotted this isn't the cheapest of products but thankfully there is a smaller sample size pot of it in the Butterfly Giftset (£8.95 here) which also contains a wonderful soap that has a cream lather ideal for the shower. If you love super moisturising products that smell amazing then this body conditioner is for you! Following along similar lines to Ro's Argan this is another in-shower body moisturiser but a lighter option and one that doubles up as a body wash! Compared to general body washes/shower gels this comes out of the tube like a buttery moisturiser but on contact with wet skin and when rubbed this give a wonderful soft lather and smells beyond yummy - think a sweet vanilla, pistachio scent (kind of popcorn-y like the S&G Smoothie Star Buttercream!). Once out of the shower you definitely notice a moisturised feel to the skin but anyone with extra dry skin may want to still moisturise.This also works well as a moisturising shaving cream as it doesn't lather if it's not rubbed and just glides over the skin - a great multi-tasking product. 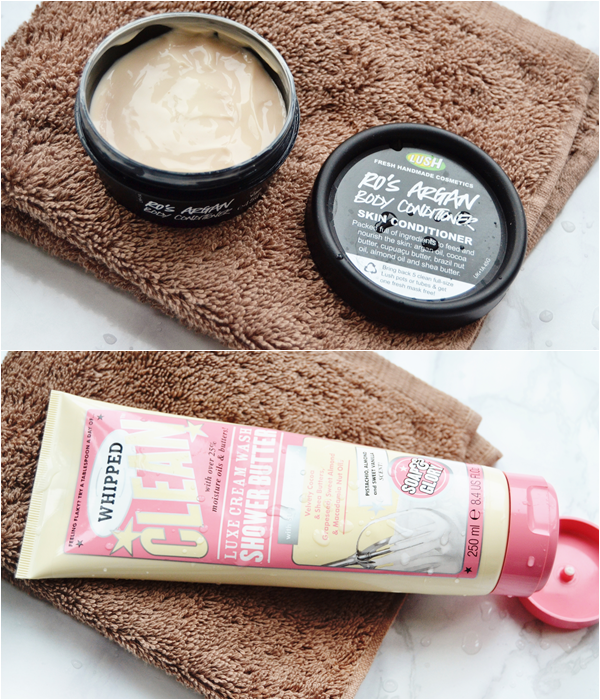 If you love most of Soap & Glory's products and love their yummy scent then this is a must to add to your stash. Perfect for both summer and winter. Another two-in-one product here that I pleasantly surprised by (I generally can't stand the chemically smell of Tresemme products). This is actually an all over hair conditioner that can be used on the scalp, the length of the hair and the ends. Surprisingly this moisturises the hair well but doesn't leave the roots of the hair at all greasy, in fact they feel soft and my scalp does actually feels renewed. 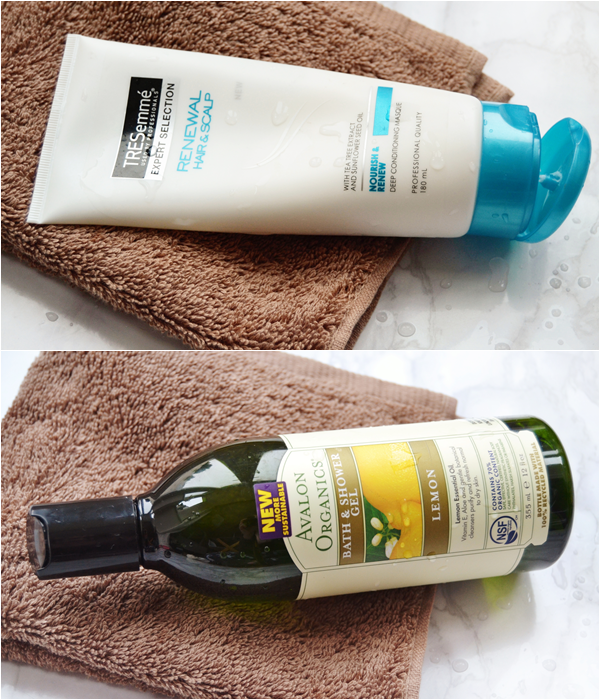 This isn't the most intensive conditioner so I still opt to use my favourite Aussie 3 Minute Deep Conditioner over the ends of my hair. Overall this is quite a unique hair/scalp conditioner on the high street and one I will keep on purchasing. Finally Tresemme you have ditched the awful chemicals and come up with a pretty great product! Finally a lovely organic shower gel from a brand that was totally new to me. This is of course SLS and nasties free with a whole load of essential oils packed in there. I just had to include this shower gel as finding body washes for sensitive skin can be hard on the high street and ones that smell nice! This specific shower gel lather well, smells lovely and fresh and most importantly caters for anyone with sensitive skin or anyone wanting an organic product. Also so little is needed of the huge 350ml bottle meaning this really does last ages! A great all round shower product that I'm very glad to have discovered. Are you more of a shower or bath person? What products do you love to use?